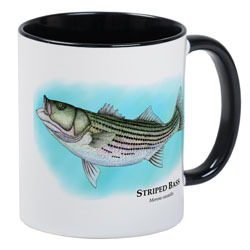 An assortment of items that would make good gifts for striped bass and largemouth fishermen are shown below. 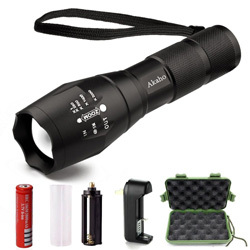 Links are provided to Amazon.com where you can find out more about these gift ideas, and if you like, purchase any item. Scroll down to see all the gift ideas. Durable white ceramic with easy grip handle. 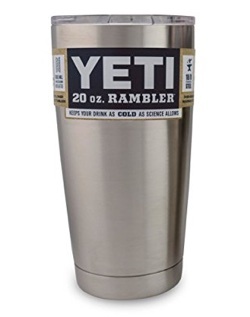 Features of the YETI Rambler Tumbler: Kitchen-grade 18/8 stainless steel. Double-wall vacuum insulation Keeps ice 2X longer than plastic tumblers and are designed for maximum ice retention and work just as well for hot beverages. BPA free Crystal clear lid. Every man needs a go to hat. 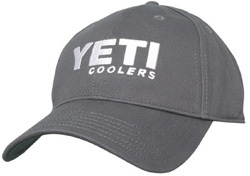 This Low Profile Hat in Gunmetal Grey by YETI fits the mold as it's crafted from 100% cotton and features a simple design. Once you own it, you'll never leave home without it! Relaxed, roomy fit; 100% cotton. 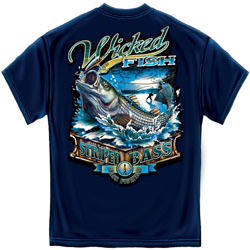 Double needle short sleeve and bottom hem for durability. 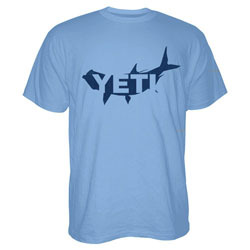 Navy blue YETI Logo inside a tarpon silhouette. Printed on a Steel Gray Shirt. 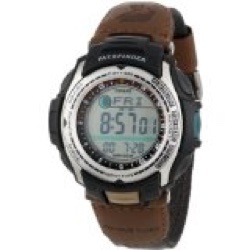 This watch features moon age and phase data, fishing timer, vibration alert, sunrise and sunset data, stopwatch, 40-record time memo, five daily alarms and water resistance to 100 meters. 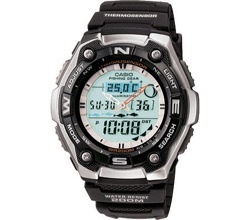 The Casio Men's Pathfinder Fishing Timer Watch is water resistant to 300 feet and includes a unique compass function, making it the perfect accessory for fishermen and other outdoorsmen. Constructed with a stainless steel case, the watch includes a stationary stainless steel bezel, and a black leather wristband with an adjustable buckle clasp for the perfect fit. A durable mineral window shields the black and digital-gray dial face, which features silver-tone Arabic numeral hour indexes, and a digital time display at the six o'clock position. The digital display shows the time, as well as the day, date, and moon cycle. This quartz-powered timepiece includes an illumination function, and a 10-year battery life. 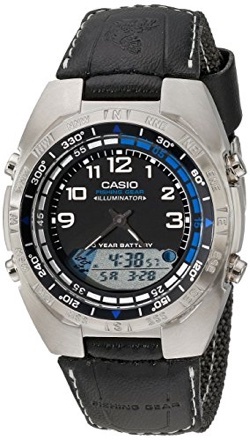 This watch features a thermometer, EL Backlight with afterglow, fishing timer mode, moon data, world time (50 cities), 1/100 second stopwatch, countdown timer, daily alarm, hourly time signal, full auto-calendar, 12- and 24-hour formats, and water resistance to 200 meters. Artwork is Featured in a Radiant Shiny High Gloss! Fine Art in Vivid Colors with Crisp Super High Detail! Completely Weatherproof with UV protection and moisture resistant technology to ensure the Highest Quality! Great Quality Vinyl Cut, Water-Carwash-Weather Proof Lettering.
. Rust, Corrode And Fade Free With Up To 10 Years Life Time. 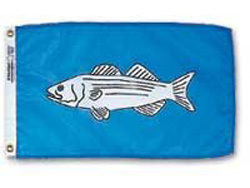 fits all standard license plates; measures 12" x 6"
The Striped Bass Boat Flag measures 12â€� x 18â€�. The flag is constructed of lightweight, yet durable, fade resistant nylon fabric. Sewn-in brass grommets are included. The flags are perfect for all weather conditions. 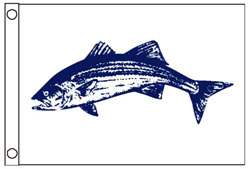 The Striped Bass Flag measures 12â€� x 18â€�. The flag is constructed of nylon. 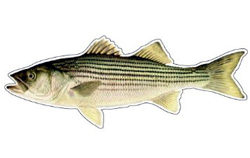 H 1Â¾" x W Â¾"
H Â¾" x W 1 Â¾"
Nicely Detailed Realistic Stuffed Plush Striped Bass. 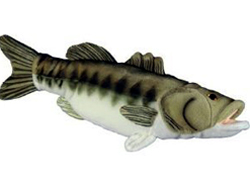 Realistic-Looking Stuffed Plush Largemouth Bass. 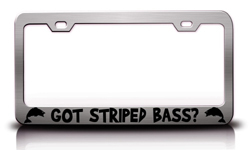 INDUSTRIAL GRADE, FULL COLOR, CUT VINYL DECALS IN UNBELIEVABLE DESIGNS & PHRASES. Big predator in a small package, if your the prey. Decal measurements are 10.9" wide X 5.95" tall. Fisherman you won't believe your eyes!! This Decal is approx. 3.5" high x 10" wide printed with top quality UV inks on exterior grade weatherproof vinyl. These decals are true to life photo quality images. 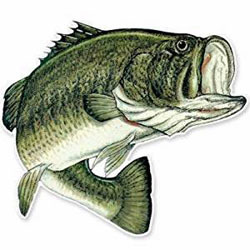 All fish decals are die cut for easy installation. High quality strong outdoor grade vinyl sticker. Great for any flat surface: car, boat, wall, etc. Nice Large Size. Simple peel & stick application. Outdoor life - 3 -5 years. Pad size: 9.25 Â¡Ã� 7.75 in. Optical-friendly mouse pad for improved tracking. Pad size ideal for moving your mouse freely when gaming. 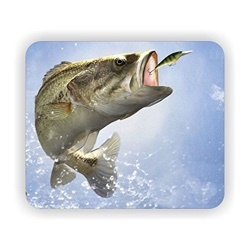 This 9.25" x 7.75" rectangular largemouth bass mousepad is made of a durable heat-resistant polyester fabric top, will keep your mouse rolling in style. 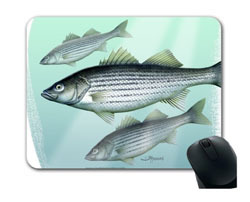 Backed with a neoprene rubber non-slip backing, keeps the mousepad from sliding. The mousepad is 1/8" thick. It will not discolor or fade, machine washable. Fabric Placemat maked made from a polyester fabric. No Ironing required. Wash cold water. Stain resistant. Add artwork to your table. 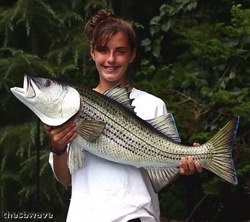 Giant Taxidermy Quality Striped Bass Wall Mount He measures 44" in length Amazing girth of 28" Over Three and a half feet long! Brand new mold, this fish is really special! Constructed of heavy fiberglass, hand painted complete with bracket. 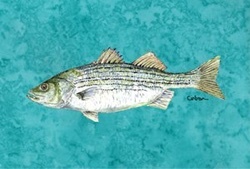 Fish is a full mount, finished on one side. Glass eye completes the look. 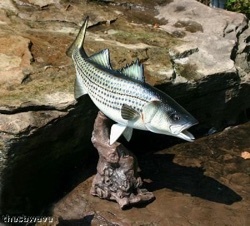 Want that trophy fish for the den, or office? How about this one? 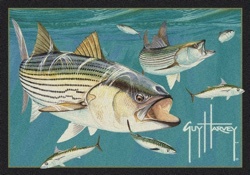 Fiberglass Taxidermy Striped Bass Wall Mount 34"
Each rug is a replica image of one of Guy's original paintings. 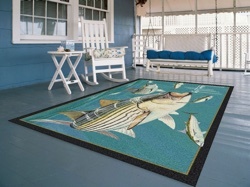 The area rugs are made from 100% nylon pile, injected with colorfast dyes throughout to make them durable and beautiful. Size: 2'8" x 3'10" Rectangle. 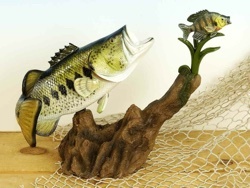 Large Mouth Bass Statue on stand measures 20" long. 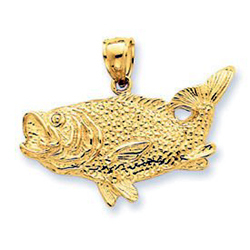 This fish is finished beautifully from all angles, a spectacular 360 degree view. You can change your view of him everyday! 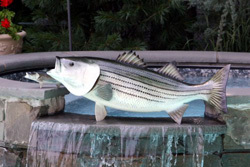 This fish is constructed of heavy fiberglass, hand painted, air brushed and protected with a clear coated finish. He sits on a resin base. This fish has a pair of glass eyes to complete its realistic design. © Copyright 2015. All Rights Reserved. Advanced Systems.